A question I am often asked at my Japanese and Nikkei supper club is about Wagyu beef. There is such a mystique about it, with stories of pampered cattle receiving daily massages and drafts of beer to enhance their flavour and texture. But is it all true, I am asked? So I thought I would pen a few words about it here. A recent visit to the BBC Good Food Show to see my friend Chef Daniele Codini at the Japanese Wagyu beef stand made me think a little deeper about Wagyu. After 300 years of isolation from the outside world, Japan was a rural nation that relied heavily on oxen for agricultural purposes. Coupled with a Buddhist reluctance to take animal life, a nationwide ban on meat-based diets was imposed. It was not until the end of the Meiji Restoration in 1872, prompted by an announcement by the Japanese Emperor that he was consuming beef, that the Japanese started experimenting with it. And for a country that has only eaten beef since the late 19th century, Japan has perfected the raising of top quality beef to an exquisite level by a relentless focus on quality control, animal husbandry and cross-breeding. Wagyu in its most literal form simply means Japanese beef – ‘Wa’ being a prefix referring to Japan, and ‘gyu’ meaning cow. So Wagyu refers to any Japanese cattle. There are four different native Japanese breeds of cattle, with the most prized being those providing the highest degree of fat marbling. The Japanese black breed makes up 90% of all Wagyu beef cattle, with the brown, polled and short-horned breeds making up the other 10%. In several areas of Japan, Wagyu beef is shipped carrying area names, for example Kobe beef – contrary to what many think, there is no Kobe breed, but the meat is so called because it comes from Kobe and its surrounding areas. Kobe beef became popular in the 20th century as the first Westerners arrived to trade at the port of Yokohama, near Tokyo. They saw the name Kobe beef on restaurant menus, and the name caught on outside Japan. Are the cows really massaged and do they drink beer? No, this is an urban myth. In addition to genetics, Wagyu beef is so special because of the great deal of care that goes into raising the cattle by the Japanese farmers. Every calf is given a name, not just a number, and a birth certificate with the names of not only its parents, but also its grand parents and great grand parents. This ensures that the pedigree is impeccable. The calves are weaned soon after birth, then milk-fed by hand, and even provided with hand-made jackets in the colder months. This is all followed by a stringent process of fattening them up for slaughter. Why is the meat so delicious? There are two main reasons – firstly, the genetic make-up of the indigenous Japanese cattle, and secondly, the high degree of expertise and care of the farmers in raising them. Consequently, the meat has a high degree of fat marbling (known in Japan as meat snow), which gives it a melt in the mouth tenderness and a wonderful creaminess, with a strong flavour described as having peach and coconut tones. In addition, Wagyu beef has a high content of oleic acid (a monounsaturated omega-9 fatty acid found mostly in olive oil) which is believed to enhance the flavour of the meat. After the animals are slaughtered, there is a strict grading of the meat to ensure that purchasers know exactly what they are paying for. Wagyu beef is graded on a matrix for its quality and marbling (from 5 to 1) and yield (from A to C), with the highest being A5. You might have heard of Wagyu beef from countries other than Japan, but these are not 100% Wagyu beef since Japan has only ever exported male Wagyu cattle abroad. The so-called Wagyu beef from Wales, Australia or the USA therefore come from crosses of male Wagyu with breeds native to these other countries, and are thus only 50% Wagyu. 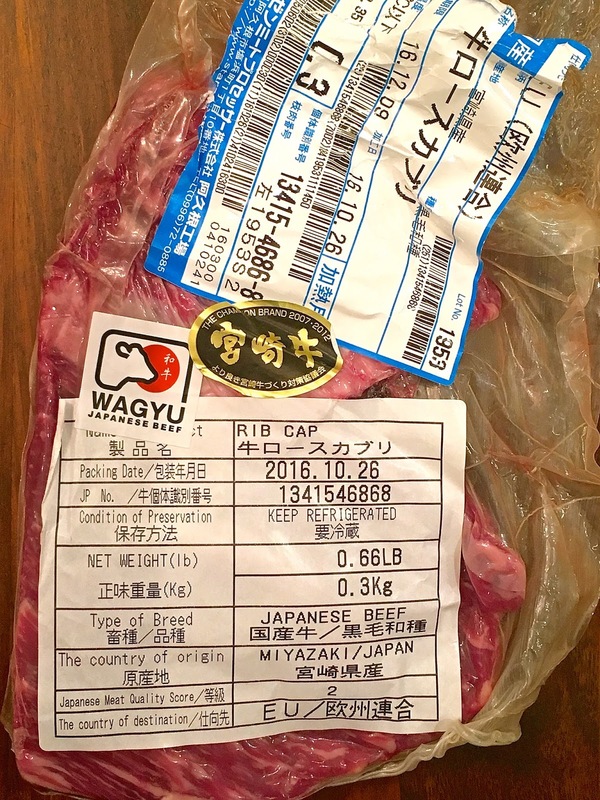 If you want to make sure that you are purchasing 100% Wagyu beef, check that the Universal Wagyu Mark is on the packaging. This proves that the meat comes from cattle that is 100% Wagyu and its lineage can be traced back three generations. It was great seeing Wagyu beef being promoted by the Japan Livestock Products Export Promotion Council, and presented at venues like the BBC Good Food Show. Chef Daniele Codini, head chef at Percy & Founders but formerly at the Japanese restaurant Yashin Ocean House, was at the BBC Good Food Show demonstrating how Wagyu beef can be cooked and enjoyed in a British home. I loved his Wagyu sirloin (A2 quality from Miyazaki prefecture), simply pan-fried on a very hot pan, seared on the outside but rare in the middle, akin to a Japanese ‘tataki’ style dish. It was served with a delicious mayonnaise made from charcoal smoked oil, and topped with ponzu gelatin flavoured with truffle oil, and pickled carrots. The meat was outstandingly good, creamy and so flavoursome, and paired with Daniele’s gorgeous presentation and clever balancing of flavours, this was a dish to remember! For a more traditional British recipe, Daniele’s second dish was a posh Sunday Roast using wagyu top rump beef. Sous-vide for an hour, the rump was then seared in a very hot pan, and served with a delectable cream of fresh grated horseradish mixed with creme fraiche, chives and salt. The vegetable accompaniment was steamed potato (lightly coloured in the pan with Wagyu fat), and girolle mushrooms seasoned with thyme, garlic and bayleaf. 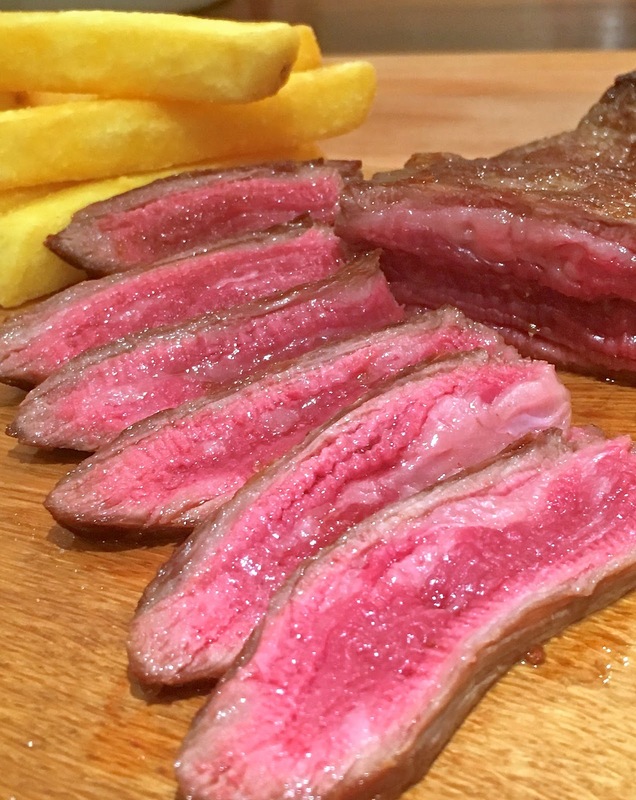 Why not try Japanese Wagyu at home? Daniele’s recipes were utterly delicious and I enjoyed the freshness that he brought into them by adding citrus and vinegared flavours to balance the fat and creaminess of the beef. During my time living in Japan, I purchased wagyu on a number of occasions – I must admit, I did very little to them though, preferring to simply pan-frying the meat (seasoned with a little olive oil and salt) and serving them with chips, HEAVEN! With a 13-year ban on Wagyu beef lifted in the UK in 2014, and the availability of 100% Wagyu beef now becoming more widespread, you do not need to travel to Japan to try this delicacy. Wagyu beef is not cheap, but good quality ingredients never are – prices vary substantially depending on quality, but as a treat on special occasions, I can think of very few things that can beat a seared Wagyu steak, served with some home-made chips and a big glass of Barolo red wine! Wagyu is not truly cheap but the taste is really great than kobe beef.